10 A None No Power Seat 10 A is a standard Business Class seat however, the proximity to the galleys may be bothersome. 10 C None No Power Seat 10 C is a standard Business Class seat however, the proximity to the galleys may be bothersome. 10 D None No Power Seat 10 D is a standard Business Class seat however, the proximity to the galleys may be bothersome. 10 E None No Power Seat 10 E is a standard Business Class seat however, the proximity to the galleys may be bothersome. 10 F None No Power Seat 10 F is a standard Business Class seat however, the proximity to the galleys may be bothersome. 10 H None No Power Seat 10 H is a standard Business Class seat however, the proximity to the galleys may be bothersome. 10 K None No Power Seat 10 K is a standard Business Class seat however, the proximity to the galleys may be bothersome. 12 A None No Power Seat 12 A is a standard Business Class seat however, the proximity to the lavatories, galleys, and position of the bassinets may be bothersome. 12 C None No Power Seat 12 C is a standard Business Class seat however, the proximity to the lavatories, galleys, and position of the bassinets may be bothersome. 12 D None No Power Seat 12 D is a standard Business Class seat however, the proximity to the lavatories, galleys, and position of the bassinets may be bothersome. 12 E None No Power Seat 12 E is a standard Business Class seat however, the proximity to the lavatories, galleys, and position of the bassinets may be bothersome. 12 F None No Power Seat 12 F is a standard Business Class seat however, the proximity to the lavatories, galleys, and position of the bassinets may be bothersome. 12 H None No Power Seat 12 H is a standard Business Class seat however, the proximity to the lavatories, galleys, and position of the bassinets may be bothersome. 12 K None No Power Seat 12 K is a standard Business Class seat however, the proximity to the lavatories, galleys, and position of the bassinets may be bothersome. 17 A None No Power Seat 17 A is a standard Economy Class seat that may have restricted legroom due to the position of the bulkhead. The position of the bassinets may also be bothersome. 17 B None No Power Seat 17 B is a standard Economy Class seat that may have restricted legroom due to the position of the bulkhead. The position of the bassinets may also be bothersome. 17 C None No Power Seat 17 C is a standard Economy Class seat that may have restricted legroom due to the position of the bulkhead. The position of the bassinets may also be bothersome. 17 D None No Power Seat 17 D is a standard Economy Class seat that may have restricted legroom due to the position of the bulkhead. The position of the bassinets may also be bothersome. 17 E None No Power Seat 17 E is a standard Economy Class seat that may have restricted legroom due to the position of the bulkhead. The position of the bassinets may also be bothersome. 17 F None No Power Seat 17 F is a standard Economy Class seat that may have restricted legroom due to the position of the bulkhead. The position of the bassinets may also be bothersome. 17 H None No Power Seat 17 H is a standard Economy Class seat that may have restricted legroom due to the position of the bulkhead. The position of the bassinets may also be bothersome. 17 J None No Power Seat 17 J is a standard Economy Class seat that may have restricted legroom due to the position of the bulkhead. The position of the bassinets may also be bothersome. 17 K None No Power Seat 17 K is a standard Economy Class seat that may have restricted legroom due to the position of the bulkhead. The position of the bassinets may also be bothersome. 27 C None No Power Seat 27 C is a standard Economy Class seat that has extra legroom due to the exit however, the proximity to the lavatories may be bothersome. 27 D None No Power Seat 27 D is a standard Economy Class seat however, the proximity to the lavatories may be bothersome. The position of the bassinets may also be bothersome. 27 E None No Power Seat 27 E is a standard Economy Class seat however, the proximity to the lavatories may be bothersome. The position of the bassinets may also be bothersome. 27 F None No Power Seat 27 F is a standard Economy Class seat however, the proximity to the lavatories may be bothersome. The position of the bassinets may also be bothersome. 27 H None No Power Seat 27 H is a standard Economy Class seat that has extra legroom due to the exit however, the proximity to the lavatories may be bothersome. 38 C None No Power Seat 38 C is a standard Economy Class seat however, the proximity to the lavatories and galleys may be bothersome. 38 H None No Power Seat 38 H is a standard Economy Class seat however, the proximity to the lavatories and galleys may be bothersome. 39 A None No Power Seat 39 A is a standard Economy Class seat however, the proximity to the lavatories and galleys may be bothersome. 39 B None No Power Seat 39 B is a standard Economy Class seat however, the proximity to the lavatories and galleys may be bothersome. 39 D None No Power Seat 39 D is a standard Economy Class seat however, the proximity to the lavatories and galleys may be bothersome. 39 F None No Power Seat 39 F is a standard Economy Class seat however, the proximity to the lavatories and galleys may be bothersome. 39 J None No Power Seat 39 J is a standard Economy Class seat however, the proximity to the lavatories and galleys may be bothersome. 39 K None No Power Seat 39 K is a standard Economy Class seat however, the proximity to the lavatories and galleys may be bothersome. 40 D None No Power Seat 40 D is a standard Economy Class seat however, the proximity to the lavatories and galleys may be bothersome. 40 E None No Power Seat 40 E is a standard Economy Class seat however, the proximity to the lavatories and galleys may be bothersome. 40 F None No Power Seat 40 F is a standard Economy Class seat however, the proximity to the lavatories and galleys may be bothersome. 41 A None No Power Seat 41 A is a standard Economy Class seat that has extra legroom due to the exit however, the proximity to the lavatories and galleys may be bothersome. 41 C None No Power Seat 41 C is a standard Economy Class seat that has extra legroom due to the exit however, the proximity to the lavatories and galleys may be bothersome. 41 H None No Power Seat 41 H is a standard Economy Class seat that has extra legroom due to the exit however, the proximity to the lavatories and galleys may be bothersome. 41 K None No Power Seat 41 K is a standard Economy Class seat that has extra legroom due to the exit however, the proximity to the lavatories and galleys may be bothersome. 42 D None No Power Seat 42 D is a standard Economy Class seat that may have restricted legroom due to the position of the bulkhead. The proximity to the galley and position of the bassinets may be bothersome. 42 E None No Power Seat 42 E is a standard Economy Class seat that may have restricted legroom due to the position of the bulkhead. The proximity to the galley and position of the bassinets may be bothersome. 42 F None No Power Seat 42 F is a standard Economy Class seat that may have restricted legroom due to the position of the bulkhead. The proximity to the galley and position of the bassinets may be bothersome. 43 C None No Power Seat 43 C is a standard Economy Class seat that has extra legroom due to the missing seat in front however, other flyers tend to bump into this seat. 43 H None No Power Seat 43 H is a standard Economy Class seat that has extra legroom due to the missing seat in front however, other flyers tend to bump into this seat. 50 A None No Power Seat 50 A is a standard Economy Class seat that has extra legroom due to the angling of the seat. 50 K None No Power Seat 50 K is a standard Economy Class seat that has extra legroom due to the angling of the seat. 52 A None No Power Seat 52 A is a standard Economy Class seat in the last row of the aircraft that may have limited recline. The proximity to the galleys may be bothersome. 52 B None No Power Seat 52 B is a standard Economy Class seat in the last row of the aircraft that may have limited recline. The proximity to the galleys may be bothersome. 52 C None No Power Seat 52 C is a standard Economy Class seat in the last row of the aircraft that may have limited recline. The proximity to the galleys may be bothersome. 52 D None No Power Seat 52 D is a standard Economy Class seat in the last row of the aircraft that may have limited recline. The proximity to the galleys may be bothersome. 52 E None No Power Seat 52 E is a standard Economy Class seat in the last row of the aircraft that may have limited recline. The proximity to the galleys may be bothersome. 52 F None No Power Seat 52 F is a standard Economy Class seat in the last row of the aircraft that may have limited recline. The proximity to the galleys may be bothersome. 52 H None No Power Seat 52 H is a standard Economy Class seat in the last row of the aircraft that may have limited recline. The proximity to the galleys may be bothersome. 52 J None No Power Seat 52 J is a standard Economy Class seat in the last row of the aircraft that may have limited recline. The proximity to the galleys may be bothersome. 52 K None No Power Seat 52 K is a standard Economy Class seat in the last row of the aircraft that may have limited recline. The proximity to the galleys may be bothersome. This Boeing 777-300ER seats 342 passengers in a three-class configuration and is primarily used on long-haul routes. 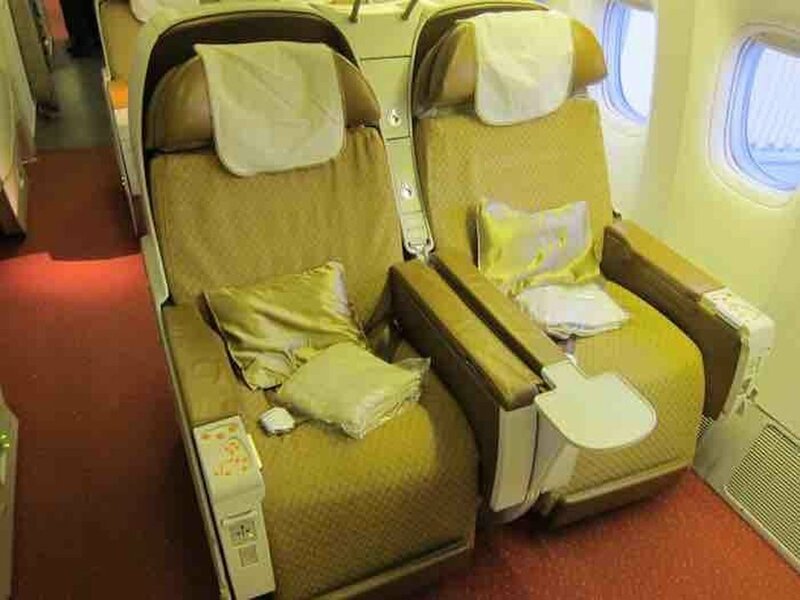 There are 4 flat bed seats in First Class, 35 flat bed seats in Business, and 303 standard Economy Class seats. 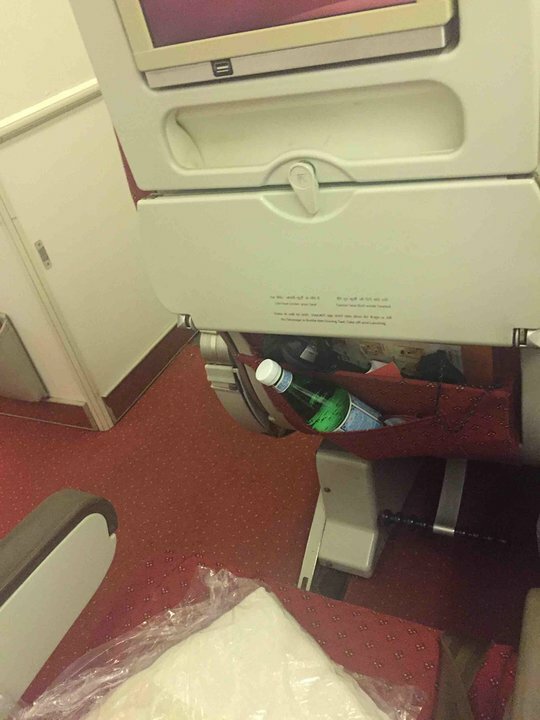 Emergency row seat does have more leg room but is thinner than a normal economy seat. If this was known ahead of time I would not have booked it for my daughter. Probably applies to all emergency row seats. Most uncomfortable seat I have ever flown in. Does not lean back, very stiff un-cushioned seat. Proximity to bassinet mounts, screaming children, the bathrooms, and galley, were highly disruptive. I didn't get the benefit of stretching my legs because of the traffic in the aisle and my seat mate who frequently got up over me. The media panel is under the seat and very hard (and dirty) to raise and lower the screen. Bought a seat over the wing because I am a white-knuckle flier, but being on 15+ hour flight with no entertainment was much scarier for me. The entertainment system for 30A was completely broken; we had to resort to banging the console after several pairs of headphones did not work. At my seat, 30C, the entertainment system only worked for one side of the headphones. 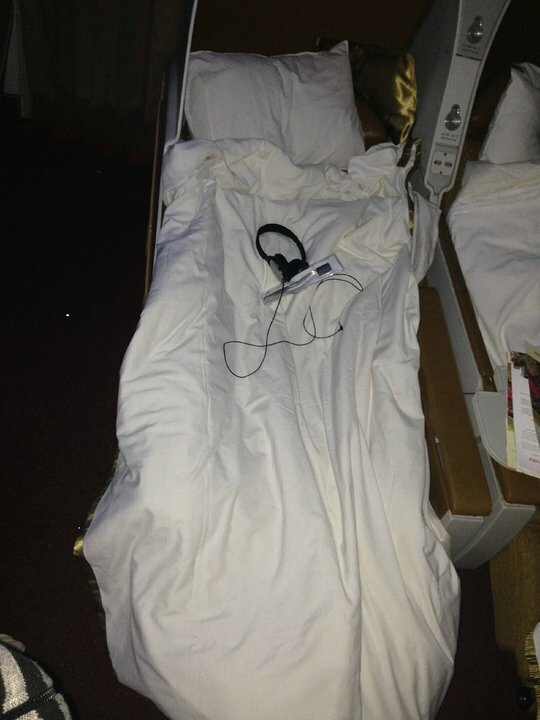 We even tried headphones from business class (although, I would argue, the pair was not of premium quality). I booked a round trip with Air India, so I will experience this hassle on the return flight as well. This time, I will make a point not to choose a seat in row 30 and in the future, I will try to avoid Air India all together. Staff had poor customer service, as if the flight was free of charge; they would even turn off/ignore the button to call for assistance. There is no seat in front of 43C so there is a lot of leg room to stretch and relax. I liked this seat. I have reserved the same seat in return flight too. The legroom is quite nice for a long-haul flight.The food was also good. The only con wad that the screen was sluggish and the IFE remote did not work. These seats have no padding at all in the back - it's like sitting against a wooden board (complete with hinges and hardware) covered by a thin sheet of fabric. 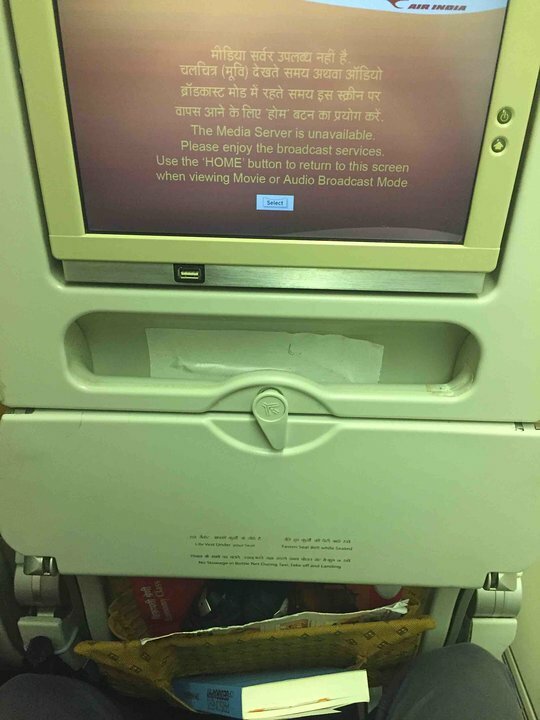 In 17C, the tray table is broken and the remote doesn't extract from it's holder. Also, the video screen for this seat has a column of bad pixels that are stuck on red, but that's ok since there are hardly any movies worth watching anyways. Due to the seat configuration, the remote holder pushes into the seat, taking up precious space. The extra legroom is nice. The seats on the plane were filthy, and not "didn't clean well last time" dirt-- it's ground in and in some places gooey. I will take a pack of wipes with me on the return flight to at least wipe everything down. I know seat 27 k and had it by chance a couple of times. THey charge extra for it now but refused to let me buy it, as their rule states that you cannot be above 50yrs old to have a exit row seat! Good leg room. Wrist screen alignment. Screen is completely misaligned with seat. One have to lean left for C seats and it gets painful in neck. Seats in BUSINESS are old, worn and uncomfortable. Too narrow, can't cross legs (I'm 5'-10"). Cushion is worn, seats are not lie-flat, about 170 degree at best. Food and service was okay but I will avoid in future due to poor condition of seats. Good leg room, good width, seat cushions needed re-bolstering, remote needed replacement, and carpets needed cleaning. Traveled on Mumbai-Riyadh sector in January 2016. Leg space was good but screen was very poor in response. 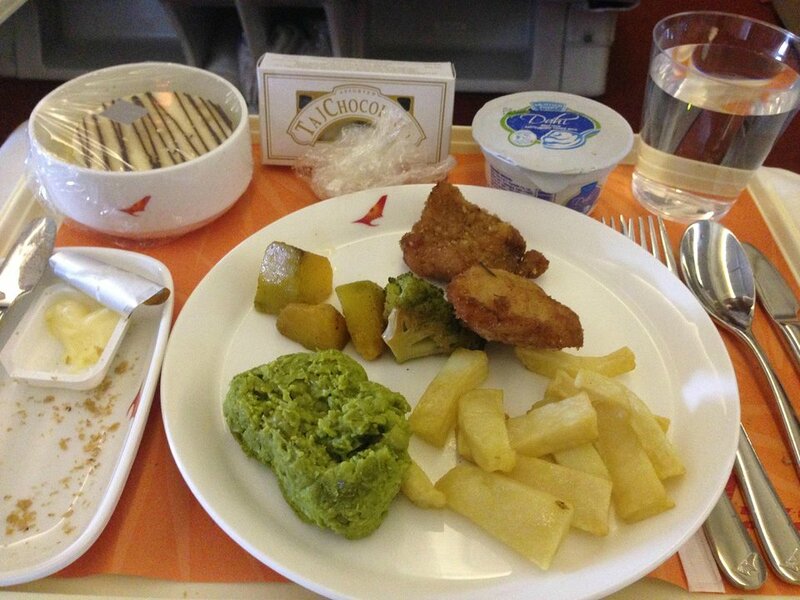 Air India Business from DEL - LHR Definitely worth it, if you are comparing any other economy class product. The movie selection was current, food was fine and the seat reclined to a flat bed. Staff were really friendly and not over bearing. I'll definitely try business in the dreamliner if I get a chance. AVOID Air India at ALL Costs !! Their "Business Class" is anything but. You sit on top of the person next to you, and the seats are incredibly uncomfortable. No space to do work... or anything else. And the Service was the WORST I've experienced. STAY AWAY ! Seatguru's seatmap is correct.42A & 42B are next to each other.Seatmap on Air India's website is incorrect,which shows a gap between these two seats.43C is good to stretch your legs.41A is not comfortab;e although an exit row seat.Window is blocked and the buldge of the door prevetns you from stretching the legs. The Air India Boeing 777-300ER I flew in VT-ALQ (Manipur). Seat 34K is is just aft of right wing. During taxi you might hear the noise of hydraulic pump specially when pilot deploys or retracts flaps. Leg room is nice on this seat as compared to other airlines 777 Air India Boeing 777 has nice leg room in economy class. I would recommend this seat for aviation lovers. Seat was as expected. Very little back support, used the provided pillow for lumbar support. Aisle arm rest can be lifted to provide some extra width. Air India flies 1 versions of Boeing 777-300ER.